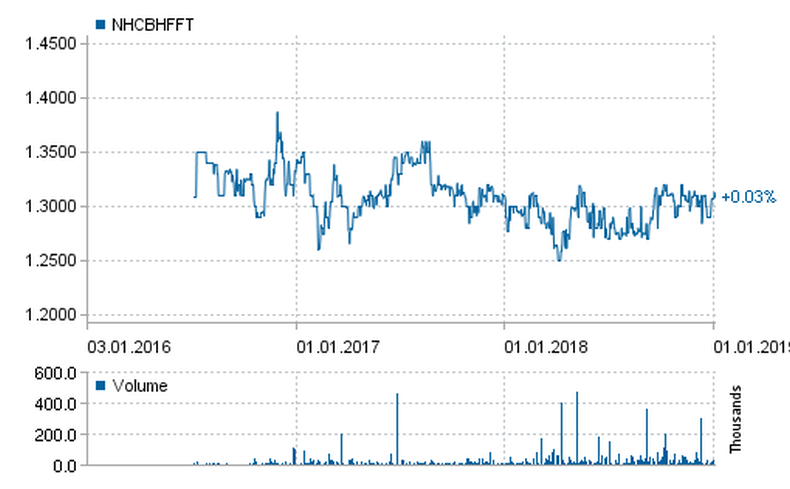 On January 3rd, 2019 I bought an additional 250 shares of Baltic Horizon Fund (NHCBHFFT) at EUR 1.311 per share. With its quarterly dividend of 0.025 euro cents per share, this latest buy has a dividend yield of 7.6% and will pay additional EUR 6.25 every quarter. Nothing to brag about, but still a decent. Baltic Horizon Fund now takes ~ 10% of my Nasdaq Baltics holdings. I don't have any plans to buy more fund units this year, but anything can change. Since being listed on Nasdaq Baltics (around July 2016) the fund's unit price has gained a tiny value of 0.03%, as you can see from the graph above, most of the history it has been up and down by a few percents. Currently, the fund is traded at EUR 1.31, which IMHO is a cheap price to buy it. Now, there is one bold reason I really like this fund, quarterly dividend payments (at least in 2017, and 2018), the yield is around 7-9%, which is among the highest yields in the Nasdaq Baltics. That said, for the second year in a row, I'm very satisfied having Baltic Horizon Fund in the Nasdaq Baltic's portfolio. How about you, are you investing in the Baltic's? Probably Baltic Horizon fund? Leave a comment, readers and I would love to hear!